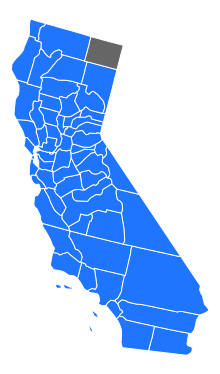 The 2016 United States presidential election in California of November 8, 2016, was won by Democrat Hillary Clinton with a 61.7% majority of the popular vote over Republican Donald Trump. California's 55 electoral votes were assigned to Clinton. Clinton won the state with 61.73% of the vote and a 30.11% margin, both the highest since Franklin D. Roosevelt's 66.95% vote share and 35.25% margin in 1936. This was also the first time Orange County voted Democratic since 1936, when Franklin D. Roosevelt swept every single county in the state. Trump's vote share in the state (31.62%) was the lowest for a major-party candidate since John W. Davis's 8.2% in 1924. On June 7, 2016, in the presidential primaries, California voters expressed their preferences for the Democratic, Republican, Green, and Libertarian, Peace and Freedom, and American Independent parties' respective nominees for president. While California has had a top-two candidates open primary system since 2011, presidential primaries are still partisan races. Registered members of each party may only vote in their party's presidential primary. Unaffiliated voters may choose any one primary in which to vote, if the party allows such voters to participate. For 2016, the American Independent, Democratic and Libertarian, parties have chosen to allow voters registered with no party preference to request their respective party's presidential ballots. Donald Trump, the only candidate with an active campaign, won each Congressional district by substantial margins, as well as all the statewide delegates, to capture all 172 votes. Libertarian primary results by county. The primary took place after Gary Johnson won the Libertarian nomination at the Party's 2016 convention. The American Independent Party, a far-right and paleoconservative political party that formed when endorsing the candidacy of George Wallace in 1968 held a small presidential primary on June 7. It was won by attorney Alan Spears. The American Independent Party nullified the results of this primary when they endorsed Donald Trump in August. The party indicated that Trump was a popular write-in choice during the primary, but was not allowed on the ballot because there was no evidence that Trump wanted the American Independent endorsement. Below is an official list of Recognized Write-in Candidates. California law only requires that 55 "electors" sign on to declare a person a write-in candidate, not that the person consent, according to a statement from the Secretary of State's Office. Final results by county certified December 16, 2016. Clinton won 46 of the 53 congressional districts, including 7 held by Republicans. Official outcomes by city. Clinton won in 367 cities while Trump won in 113 cities. 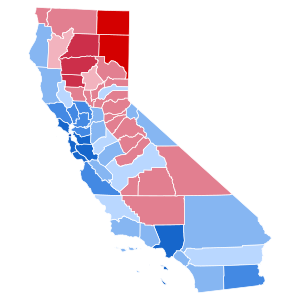 California has voted Democratic in every presidential election since Republican George H. W. Bush won the state in 1988. Hillary Clinton easily continued the Democratic tradition in California, winning the state with 61.7% of the vote, Clinton's second highest vote percentage of any state, behind Hawaii. Donald Trump received 31.6% of the vote, a Democratic victory margin of 30.11 points. California was one of eleven states where Hillary Clinton outperformed outgoing President Barack Obama in 2012, and contributed to Clinton's national popular vote victory. 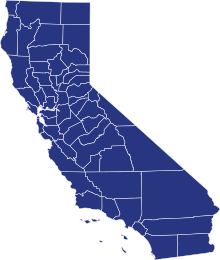 The California state result was historically one of the most successful for the Democratic Party nominee by several measures, as Hillary Clinton carried California by the largest margin of any Democratic candidate since Franklin D. Roosevelt swept the state by 35.25% in his 1936 re-election landslide. Clinton was also the first Democrat since FDR in 1936 to win traditionally Republican Orange County. 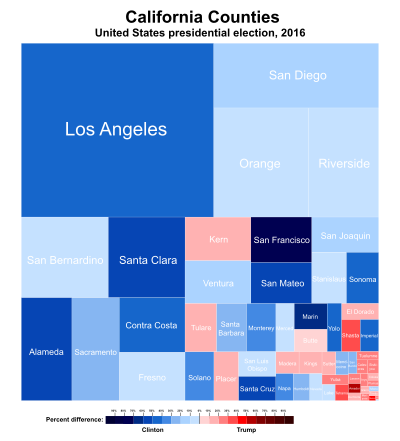 Clinton received nearly 72% of the vote in Los Angeles County, making her the first Democratic presidential candidate in history to receive over 70% of the vote in Los Angeles County,[not in citation given] the most heavily populated county in the United States. ^ a b "Frequently Asked Questions | California Secretary of State". Sos.ca.gov. Retrieved November 13, 2016. ^ "County Clerk/Registrar of Voters (CC/ROV) Memorandum #16036" (PDF). Elections.cdn.sos.ca.gov. Retrieved November 13, 2016. ^ a b "June 7, 2016, Presidential Primary Election | California Secretary of State". Sos.ca.gov. June 7, 2016. Retrieved November 13, 2016. ^ "Presidential Primary Election - Statement of Vote, June 7, 2016". Office of the Secretary of State of California. Government of California. Retrieved August 8, 2016. 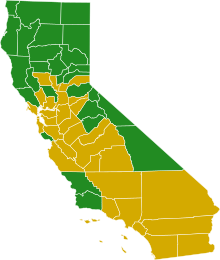 ^ "President Green - Statewide Results | Primary Election | California Secretary of State". vote.sos.ca.gov. Retrieved June 19, 2016. ^ "President American Independent - Statewide Results". Office of the Secretary of State of California. Government of California. June 8, 2016. Retrieved June 18, 2016. ^ Myers, John. "Donald Trump will be the nominee of two parties on California's November ballot". Los Angeles Times. Los Angeles Times. Retrieved November 27, 2016. ^ Winger, Richard (July 8, 2016). "Donald Trump Probably Won American Independent Party Presidential Primary". Ballot Access News. Retrieved August 14, 2016. ^ "President Peace and Freedom - Statewide Results". Office of the Secretary of State of California. Government of California. June 8, 2016. Archived from the original on November 9, 2012. Retrieved June 18, 2016. ^ "California, your official presidential write-in options include Bernie Sanders and Evan McMullin". Los Angeles Times. October 28, 2016. Retrieved November 13, 2016. ^ a b General Election - Statement of Vote, November 8, 2016. Final results certified by Alex Padilla, California Secretary of State. December 16, 2016. ^ California Secretary of State, Supplement to the Statement of Vote November 8, 2016 General Election, pp. 7–32. ^ "California Election Results 2016 – The New York Times". Retrieved November 10, 2016. ^ "West Coast Trump". The New York Times. Retrieved November 13, 2016. ^ "Presidential Election Results Los Angeles County". Los Angeles Almanac. Retrieved January 14, 2017. ^ "The 25 largest counties in the United States in 2016, by population (in millions)". Statista. Retrieved March 31, 2017.